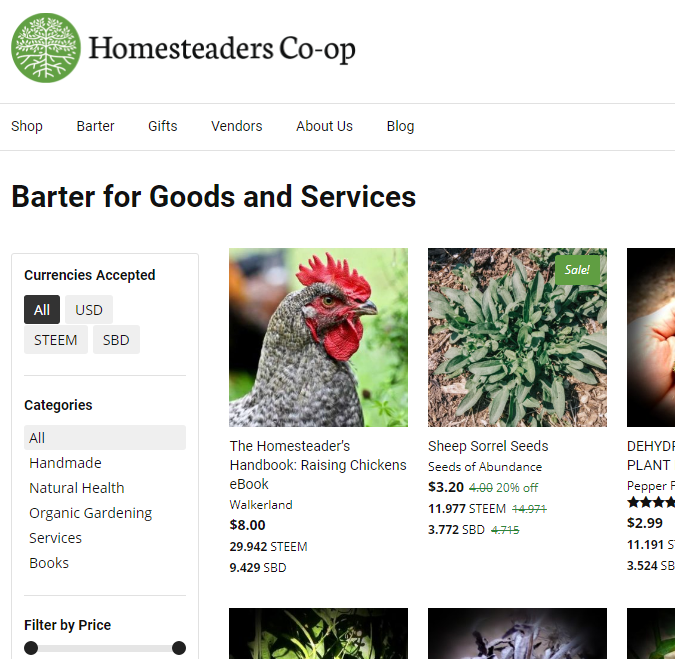 Today I am very proud to announce that we are now featuring a barter marketplace in our Homesteaders Co-op. This post is an update to our fundition project. Shop – Monetary exchange for goods and services (STEEM, SBD and USD). It is certainly possible and normal to use money (such as STEEM, SBD or USD) to make up for some value when the agreed value of goods/services being bartered are not equal. We gave our vendors the option to elect whether they are open to bartering. 8 out of 21 vendors have already specified that they are open and willing to consider bartering with customers and/or vendors. Nearly half of our vendors already see value in being able to barter. This is very positive feedback we are on the right track. By not seeking profit, our market’s participants may interchange [ @wwf ] goods and services for like value. By not choosing profit we can opt out of middlemen in our transactions. Middlemen of transactions historically seek profit. A middleman that chooses to grow, and is able to grow, plausibly passes a point of seeking profit that turns into a greed snowball. Greed places dollar signs on the backs of customers, shoppers and advertisers until they are no longer seen as humans, but are seen only as profit or lack thereof. All decisions are made based on maximizing profit or minimizing loss, rendering ethics, morality and humanity obsolete. Homesteaders Co-op is not a middleman in any transactions, whether they are made with money, by trade or as a gift. By choosing not to be a middleman we have the unique opportunity to opt out of greed. Certainly it is possible for greed to make its way into our marketplace, our minds and our actions. But our initial success and track record has been built on generosity, independence, empowerment and choice. Our actions and reputation are on the steem blockchain for anyone to audit. It was a true peer to peer exchange. It was a successful barter [ @sagescrub ] inspired by our marketplace and transacted outside of any system, even outside of Homesteaders Co-op. Because we are communicating about an exchange we have the opportunity to exchange ideas, language and ideally build more trust. When we are bartering we have a relationship that goes beyond the typical add to cart and checkout – click, click, swipe, swipe. And in the case of this barter, @papa-pepper inevitably offered to share some plants that aren’t available in his store, and that led me to feel more generous and offer more seeds to Papa Pepper that aren’t available in my store. We both got more value than we expected and a feeling of gratitude to share and trade with each other. ← Sustainability, Self-Reliance: What Does It All Mean?